Blake Jeffers, Jon Milligan and the students who constructed wood duck boxes for the Duck Conservation Society. This photo was featured in last month's issue of the Georgia Outdoor News. I thought it was a great article and public relations for the program. The link below will take you to the article. 2019 Georgia Young Farmers Association / Tag Team LCO Techology Peanut High Yield Contest Rules and entry requirements. All entries must be made by November 15, 2019. The GFB Foundation for Agriculture is pleased to once again offer four $500 grants to 4-H clubs and FFA chapters that can be used to help support leadership development and agricultural literacy projects. A list of example projects can be found by clicking here. The grant guidelines and application are attached. Applications are due May 1st. If you have any questions regarding the application or selection process, please contact Clay Talton (cstalton@gfb.org) or Haley Darby (hadarby@gfb.org). 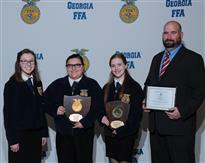 Be sure to check out the scholarship opportunities through the Georgia FFA Foundation. All applications due March 22nd. Jeff Wilson earned a marketing degree from Georgia College and worked in the cabinet industry for eight years before teaching. After earning a post-Bachelor teaching certificate from Fort Valley State University, he began teaching agriculture. In his spare time, he enjoys spending time with his wife, daughters, fishing, and writing poetry. He just recently finished his specialist and has begun working on his Doctorate. Jeff goes above and beyond to make sure his students are prepared for CDE's and life. He has coached 3 State Winning Teams this year and was only a few points shy of a 4th. Mr. Wilson Teaches at Veterans High School with his partner in crime Clay Walker.